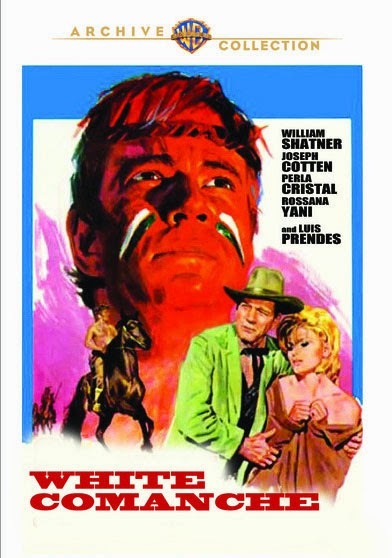 The new Warner Archive release White Comanche features William Shatner playing half-breed twins at war with each other. If you like Shatner or the kind of oddball films that he picks, or more likely inspires with his presence, then this bare bones Western will not disappoint. Just about everyone in Comanche seems lost. The hapless cast looks like it's dutifully following instructions from an elementary school drama teacher. The romantic lead appears to have missed a turn on the way to a groovy spy flick. As the sheriff of a dusty Western town, Joseph Cotten seems baffled, and maybe a bit angry to find himself so far from his Citizen Kane days. Even the soundtrack is confused, with its jazzy bass and heavy use of hi-hat cymbals you half expect to see Sammy Davis Jr. pop out of a bush to do a snappy number. But instead you get William Shatner dressed like a cowboy, trotting through the hills on a horse, and not looking a bit lost. The best thing about Shatner is he always knows exactly who he is and where he is going, and he doesn't care what anyone thinks about it. His misplaced, but mesmerizing, confidence colors everything around him and transforms a forgettable flick into an amusing oddity. Made in Spain while Shatner was on a break from filming Star Trek, he approaches each of the twins with his familiar stoic, but somehow busy intensity. One is Johnny Moon, a good-hearted wanderer who lives among the white people, the other is Notah a psychopathic peyote addict who lives among the natives, when he's not attacking stagecoaches. Clearly Moon is meant to be the strong, silent Eastwood type in this Espanol take on the spaghetti western. But as in his other roles, Bill plays the Shatner type by managing to overact underacting his role. He plays the loud version of the Shatner type as Notah, his face smeared with war paint that looks like it came from a pre-school craft table. There must also be a good barber in the tribe, because he is always clean shaven and sports a haircut more appropriate for a desk job than ambushing white people. I smile every time I think of his version of a war whoop. Everything about this film feels cheap, the tables in the saloon look like they might break before anyone gets shoved into them, and half the actors look like they're trying to remember when they're supposed to start shoving. Joseph Cotten seems like the only one in the cast who knows that he is speaking horrible lines, but he somehow manages to pull off a credible performance. Maybe he couldn't be bad if he tried. It would all be so sad if there weren't Moon Shatner fighting Notah Shatner, spitting out crazy lines, and inexplicably dressing himself exactly like his brother for the final show-down so you have no idea who is shooting who. It's a baffling experience, and that soundtrack burrows into your head for days, never letting you forget what you've been through.